Repeat volunteer Edmund talks about orientation and his first day serving at Reymontowka, a typical beautiful day in beautiful Poland. For you newcomers to Reymontowka, you will note that most of our entries into the Journal will concentrate on what we ate that day. 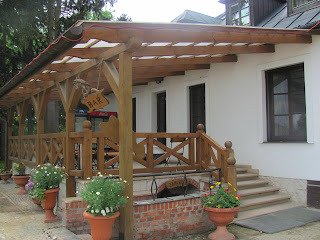 For example, our first breakfast at the Manor House consisted of a halved hard-boiled egg floating in a deliciously thickened mustard sauce, various cold cuts, fresh vegetables, just delivered hot rolls, juice, coffee, and tea. A hearty meal indeed. When Carol looked at her breakfast dish, she asked Rita if she would like some, thinking that the plate was to be shared by everyone at the table. Lo and behold, Carol was told that that is her breakfast, not the table’s. A typical beautiful day in beautiful Poland. During our initial Orientation meeting, Our Fearless Leader, Dorota, gave us a brief history of Poland and commented that Poland was freed from communism in 1989. Since then, Poland has prospered handsomely. Global Volunteers offered its services to Poland soon after that but had to change its focus of providing “hands” to Poland and provide something that Poland really needed, the understanding and usage of the English language. To paraphrase what the founder of Global Volunteers said during his meeting with the Polish representatives asking for assistance, he said that “Global Volunteers have never done anything like that before.” And the Polish representative responded, “They’ll be speaking English, won’t they?” Many years hence, Global Volunteers has provided over 2, 600 volunteers to teach conversational English to the children of Poland. Along with Our Fearless Leader, all of the volunteers went to the 12 o’clock Mass at the old wooden Trinity Church built in 1776, down the dirt road from Reymontowka. A beautiful church. The Polish people in church knew we were from Global Volunteers because we were with Dorota. After Mass, a delicious lunch was served consisting of mushroom soup, a pork cutlet topped with tomato and melted cheese, carrot and red cabbage salads, juice, coffee and tea. After some much-needed free time, the Team met with various representatives of Cisie and Spoleczna to find out what the schools would like to see the volunteers concentrate on during their class assignments. The English speaking representatives of the schools were very encouraging and the one thing that got my attention was when Kasia/Kate from Spoleczna said to me: “The students will be more nervous than you will be in the classroom. All of you will do well.” Yeah, easy for her to say. Another Orientation meeting followed, but this one had an added ingredient: classical piano music in the background. The young lady who will be performing tonight at a recital was practicing on the grand piano. A simple but delicious supper was served: cold cuts, veggies, and a creamy dessert with fresh raspberries. The Team and other guests at Reymontowka attended a concert this evening featuring eleven year old Alicja Rokita, an aspiring young pianist studying at the School of Music in Warsaw, and a student of forte pianist, Krzysztof Rynkiewicz, who performed for us several years ago. Just a typical beautiful day in beautiful Poland. Good luck team members.